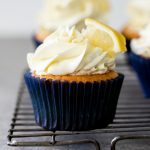 Soft and moist zesty lemon cupcakes taste like sunshine in every bite topped with swirls of Swiss meringue buttercream scented with lemon zest. 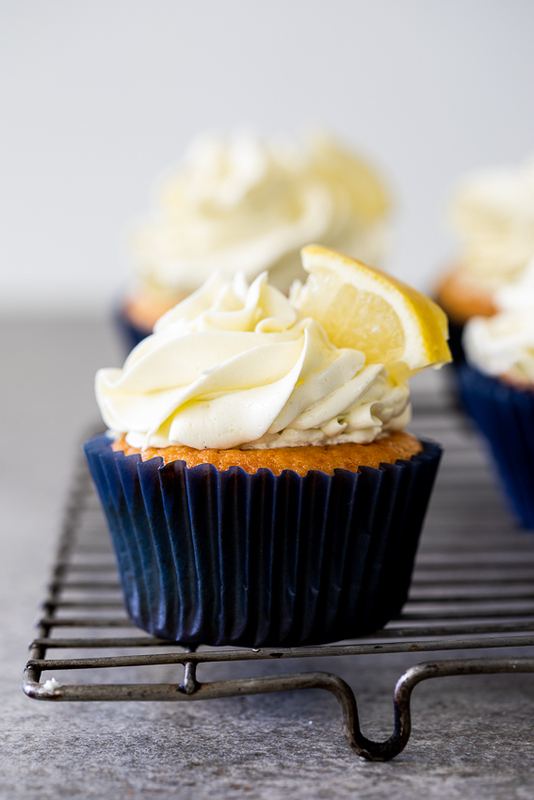 To make your cupcakes as lemony as possible, it’s important to use both the juice and zest of fresh lemons. Combine flour, baking powder and salt in a mixing bowl and mix well. In a large measuring jug, combine milk, lemon juice, canola oil, sugar, eggs and lemon zest and whisk together. Pour the wet ingredients into the dry and mix until just combined. Scoop batter into a muffin pan lined with baking cups/cupcake liners and bake until golden brown and a skewer inserted comes out clean. Allow to cool completely before decorating with frosting of your choice. What to put in cupcakes to make them moist? Using oil-based recipes always result in cakes that are soft and moist. 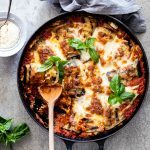 Substitute plain yogurt or sour cream for the milk in a recipe will also ensure a moist end result. Can I make cupcakes the day before? Yes. Cupcakes last very well if they are kept covered. 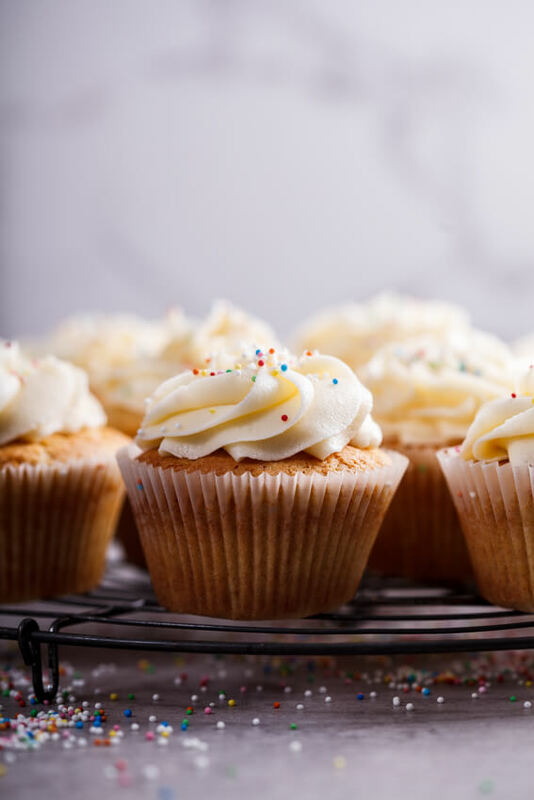 If using frosting that is stable at room temperature (any type of buttercream) they can be kept covered for up to 3 days. 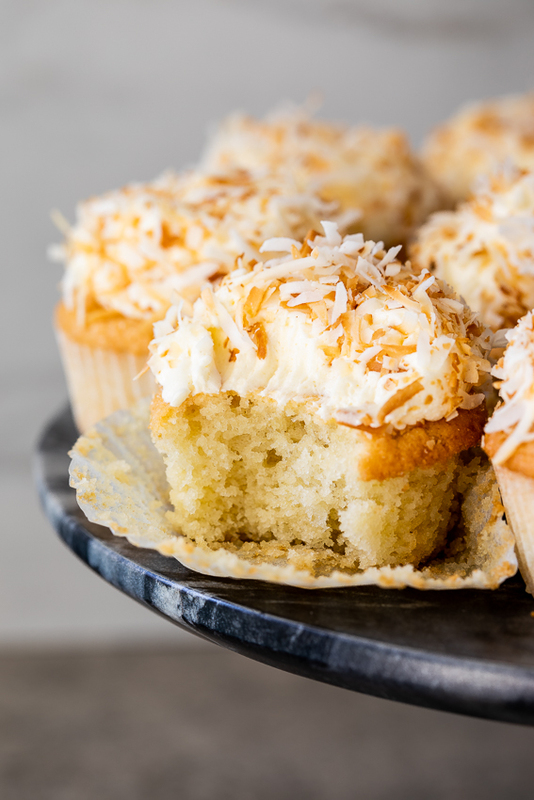 How long should cupcakes cool before frosting? Depending on how hot/cold it is outside, it takes cupcakes around 30-60 minutes to cool completely. To make sure cupcakes are cool before frosting, feel the bottoms of the cupcakes. You can also cool cupcakes quicker by placing them in the fridge for 10-20 minutes. 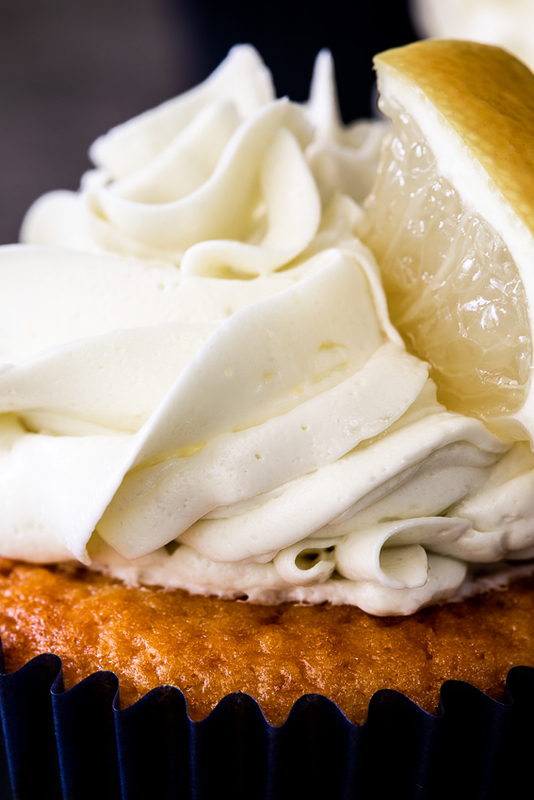 What frosting goes with lemon cupcakes? 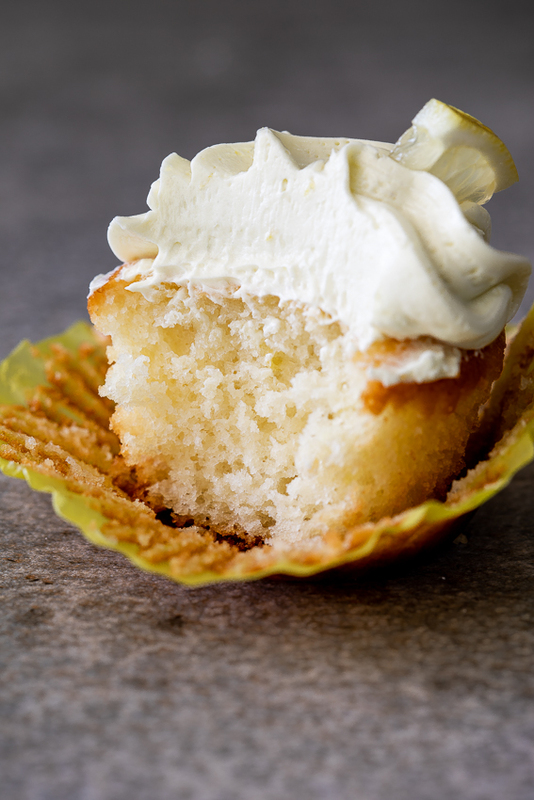 Lemon cupcakes will work with absolutely any frosting or icing. A simple lemon drizzle icing made with lemon juice and icing/powdered sugar will be delicious but for a showstopping end result, try swirls of Swiss meringue or American buttercream. Swiss meringue buttercream is a bit more laborious than American buttercream but the end result is just delicious. 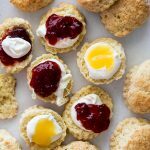 It is much lighter and less sweet than American buttercream and almost reminds me of a creamier whipped cream topping. Pre-heat the oven to 180ºC/350ºF and line muffin pans with cupcake liners/baking cases. Whisk the flour, salt and baking powder together in a large mixing bowl. Combine the milk and lemon juice in a measuring jug then allow to thicken before whisking in the oil, lemon zest, sugar and eggs. Pour the wet ingredients into the dry and whisk until just combined. Scoop the batter into the prepared baking cases and place in the oven. Bake for 15-20 minutes or until the cupcakes are golden brown and a skewer inserted comes out clean. To make the Swiss meringue buttercream, combine the egg whites and sugar in a glass/metal bowl and set over a pan of gently simmering water. Whisk continuously until the sugar has dissolved. To test, rub some of the mixture between your fingers. If you don't feel any graininess, the sugar has dissolved. If it's still grainy, just keep whisking until the mixture is smooth. Transfer egg whites to the bowl of a stand mixer and whip with the whisk attachment until thick, voluminous and cooled to room temperature. It's very important for the egg whites to be cool before adding the butter as the butter will melt and cause the mixture to become soupy if the egg whites are too hot. When the egg whites are cool, add the soft butter one tablespoon at a time until it has all been incorporated. Switch to the paddle attachment and add the lemon zest. Beat for 1-2 minutes until smooth and creamy then transfer to a piping bag and decorate the cooled cupcakes.